First American to cross Antarctic on foot, 700 miles from the Coast to the South Pole – Solo, Unsupported and Unaided.- new World Record. 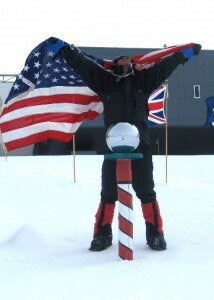 Despite ski failure 8 miles into the 700 mile journey, at 6:04PM December 21st 2008, after 39 days 7 hours and 49 minutes of solo trekking, Todd arrived at the South Pole, in ski boots, claiming the title as the first American to accomplish the feat. Moreover, Todd incredibly made up an early 50-mile deficit to go on to establish a new World Speed Record. Take a moment to review the expedition dispatches, containing podcasts from the ice.